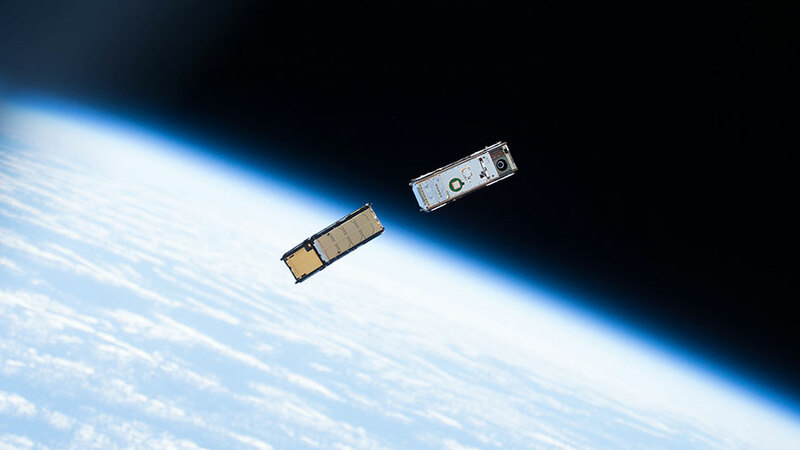 A pair of CubeSats, with the Earth’s limb in the background, is seen moments after being ejected from a small satellite deployer outside of the space station’s Kibo lab module. The week’s final set of CubeSats were deployed today from outside the Japanese Kibo lab module’s airlock. Inside the International Space Station, the Expedition 51 crew continued exploring microgravity’s effects on muscles, bone cells and vision. Over a dozen CubeSats were ejected into Earth orbit this week outside the Kibo module to study Earth and space phenomena for the next one to two years. Today’s constellation of tiny satellites will explore a variety of subjects including hybrid, low temperature energy stowage systems and the upper reaches of Earth’s atmosphere known as the thermosphere. Commander Peggy Whitson started her morning with eye checks for the Fluids Shifts study to determine how weightlessness affects eyes. That same study is also analyzing the Lower Body Negative Pressure suit for its ability to offset the upward flow of blood and other body fluids possibly affecting crew vision. Cosmonaut Fyodor Yurchikhin assisted European astronaut Thomas Pesquet into the unique suit today that draws fluids into the lower body preventing face-swelling and elevated head pressure. More bone cell samples were inserted into a science freezer during the crew’s afternoon. The samples are part of the OsteoOmics experiment researching the mechanisms that drive bone loss in space. Results may impact therapies benefitting astronaut health and those suffering bone diseases on Earth. New station crew member Jack Fischer is studying how high intensity, low volume exercise may improve muscle, bone and cardiovascular health in space. He scanned his thigh and calf muscles with an ultrasound device to help doctors understand the impacts of the new exercise techniques. Yeah is amaizin machine, on space picture. This is not about this particular subect. Howver, I was thinking. One of the problems with searching for life on Europa is that it is at least minu 170 degrees, so any ice would most likely be too hard to drill through. You could instead develop special radar, which would consist of up to 30 sensors, which could be recalibrated to investigate different things, whether it be the possibility of life on Europa, or water, or its composition, or its plumes. This is where this advanced radar system would help, because it could indentify thousands of compounds, from water to various other organis compounds considered building blocks for extraterrestrial life.